Annual celebration of the great poet, Robert Burns. The Senior Warden, Bro, Ludo Geci, was elected as Master Elect for the coming year. Other post holders were also elected. The Worshipful Master welcomed Bro. Tom Harris as a joining member of the lodge. With the help of his officers, Bro Luke Godfrey was then Passed to the Second Degree. The members and guests received an interesting paper from W.Bro. David Wight on Sir Arthur Conan Doyle. Many members, partners and friends joined in the annual celebration of the great county of Yorkshire. 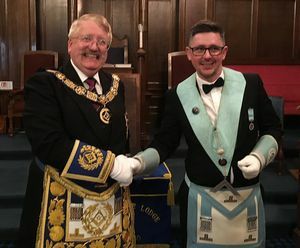 The Worshipful Master and officers of the Lodge were pleased to Initiate Mr Steven Draper and afterwards welcome him in the customary manner. The Lodge is now on its summer break, with meetings resuming in September. The Worshipful Master and officers of the Lodge Passed Bro Mehta to the degree of a Fellowcraft. In the presence of many guests, the members carried out a first class ceremony. The Lodge received a talk from V.W.Bro. S. Lines on Freemasonry and Fraternal Societies. The Worshipful Master and officers of the Lodge were pleased to Initiate Mr Luke Godfrey and afterwards welcome him in the customary manner. The Worshipful Master and officers of the Lodge were pleased to Initiate Mr Mayur Mehta and afterwards welcome him in the customary manner. The WM and his lady received many members and guests for the annual ladies evening. Afterwards, they were entertained by an Elvis lookalike. It also happened to be the day of the heaviest snow fall in Pudsey all winter, with some guests spending the night in temporary accommodation with other lodge members. A memorable evening. The officers of the Lodge gave a demonstration of the Second Degree ceremony, afterwards dining together. After a short lodge meeting, the members were entertained to a fascinating talk on Masonic music by W.Bro. Simon Lindley, PGOrg. The Worshipful Master and his lady hosted a social evening, attended by over 60 members and guests. After an excellent meal, everyone enjoyed music and dancing until late in the evening. W.Bro. David Prince was installed as the new Worshipful Master for the coming year, in the presence of many members and their guests. Afterwards, the brethren dined together and congratulated the new Master, wishing him well for the coming year. The brethren elected the Senior Warden, Bro. David Prince, as Master Elect for the coming Year. Bro. Prince will be installed at the December meeting. The members of the lodge were delighted to welcome many ladies and guests to Pudsey Masonic Hall. After a short talk from the Worshipful Master in the lodge room, an excellent meal was enjoyed by everyone. The lodge was pleased to initiate Mr. Michael Ricketts and welcome him as the newest member of the lodge.